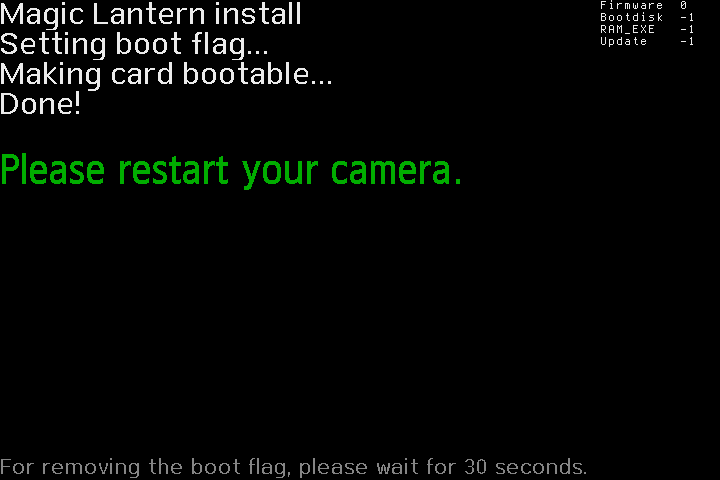 It's not exactly a "new" port, but after a few weeks of unavailability, the 50D is supported again in Magic Lantern! I'll be maintaining it, such as fixing bugs and also backporting remaining improvements from Tragic Lantern. Nightly builds are available again from http://builds.magiclantern.fm/#/, so I encourage all interested parties to download the latest builds and provide feedback. You can add issues on Bitbucket or just comment here. Thanks! 2) Make sure you are running Canon firmware 1.0.9. Downloaded and installed it. It runs with no problems. The changelog doesn't show anything. Is there some specific feature you would like to be tested ? It'd probably more instructive to look at the Bitbucket commit history, because each nightly build's changelog only shows the changes from the previous nightly build (attempt). I believe the only recent 50D-specific change was to add a warning if the FPS gets locked to 22, likely due to overheating. But, changes not specific to the 50D need to be tested as well: for example, over the past few weeks when it was not possible to download a nightly build for the 50D, there have been tweaks to the mlv_rec module, and it's always good to make sure that nothing was inadvertently broken on the 50D side. Tonight's build, when generated, will include improvements to the information displayed during LiveView. Test away! Yesterday build (07.01.2014) works OK for me. I have tested a some main features and they were OK.
Are you still interested in feedback about the ML port? But test everything else too! Yep I was testing it today. Because of the new memory backend, the nightlies were just rebuilt. As long as you download the nightly that says "Built on: 2014-02-13 15:16:33 -0500" (or the equivalent time in a different time zone), you will have all of the recent changes. Sorry, it was my mistake. I checked the .zip file - that is it! I wrote earlier about the GD. Thanks for your testing report! However, I'm not sure I understand your steps. This first recording is using mlv_rec (as opposed to raw_rec)? Is global draw set to "OFF" within mlv_rec? What is the global draw behavior like? This just sounds like the normal behavior with mlv_rec with global draw set to "OFF" (the default setting). That is, during the recording, global draw is disabled to improve the speed. After you stop the recording, does global draw get restored? I'm not sure why there'd be a difference in black stripes, but again, this sounds like the default behavior of disabling global draw during recording. Did you start with a completely clean install of the nightly (e.g., no old settings files)? Do you see different behavior when using TL? INITIAL STATE: absolutely clean nightly after card formatting. Turn on the camera. Turn on RAW recording with GD Allow. Several recordings go fine. Then just switch recording from RAW to Standard. Recordings go fine as well, nothing changes. Then I switch back to RAW recording (1584x892), making sure GD is set to Allow. Now the GD during recording of RAW video starts to disappear. At first all texts and GD is gone, then the stripes disappear, so that while recording you do not have HD aspect ratio. It's a clean screen basically, with a camera sign and timer. And yes, TL behaves the same way (( But if I use raw_rec not mlv_rec, this problem does not exist. Another glitch: when zoomed x5 the screen flickers, when x10 it is ok, Have to turn zoom x5 off to avoid that. TL has slightly different glitch -- it is not flickering, it just goes b/w with an ugly low resolution, only x5 zoom. What nightly version did you try? (write down the changeset from the Help tab in menu). and click on the changesets button on the nightly page to see what's included. Sorry, I wanted to help but I'm not too much knowledgeable in these commit things. I'll just download the latest build and test again. In short: after switching off and on the RAW MLV recording, GD (partly) desappears during recording, even though GD is ON. The upper info and black stripe is gone, below is only waveform, no info. Thanks for the clarifications and your later screenshot! I now understand and can reproduce the issue, so I (and others) can look into fixing it. I've been testing primarily with GD set to "OFF" in mlv_rec, so I hadn't noticed this issue with GD set to "Allow". This is precisely why it's so useful to get testing feedback from many people. My guess is that this is not a 50D-specific issue, but a broader issue with mlv_rec. You didn't say so explicitly, but can you confirm that flickering glitch is no longer present in the latest nightly build? What you were seeing in the TL build (blocky, grayscale preview in crop mode) is what you should now be seeing in the ML build, and is the default behavior (preview is set to "Auto" in mlv_rec). You can set preview to "Canon" in mlv_rec to get the normal Canon preview, but the framing is off in crop mode. The Canon x5 preview shows only a portion of the image that will actually be saved. Not at all, man. I'm glad to make a tiny contribution to the big ML thing. Cannot promise a thorough test, but I am certainly willing to test against my workflow. You are right, the second glitch is gone -- and the "ugly" bw picture indeed replicates the crop mode view. Amazing! The only drawback is that when I start recording in cropped mode the bw picture on the screen is renewed approx at 1 FPS rate. VERY slow. If you need more detailes about this, I can shoot a small video. Let me know. And thanks for your efforts! (I am a fan of TL and it will be great to bring its benefits into ML homeland). Any news on the progress with the 50D Global Draw issue? I've had issues with my 50D locking up on me, which never happened before. This was with the March 9, 2014 build. Any news on the progress with the 50D Global Draw issue? If you're referring to rommex's specific issue, I haven't yet put in appreciable effort to track down the bug, so the short answer is no. Are you having other issues with Global Draw? I've had issues with my 50D locking up on me, which never happened before. This was with the March 9, 2014 build. Can you reproduce these lockups, or at least provide some more information about what you were doing? Can you try the latest nightly build? There was a bunch of cleaning up of the ML code just after the March 9 nightly. Thanks for your work on 50D. Currently i own a 60D and 5Diii. Unfortunately the 60D's RAW capabilities are not that good due to slow SD card writing. Just as an opinion, would you suggest getting a 50D as a "cheap" RAW B-roll camera as company for my 5D as the main camera? Of course, cheap is relative . Since i don't own a 50D yet, do the two combine good together, feature wise? I actually rarely use my 50D for video, so I can't give an informed opinion. There are plenty of others on this forum who do, so hopefully one of them can chime in!